Map of the Austrian Empire, Italian States, Turkey in Europe, and Greece. 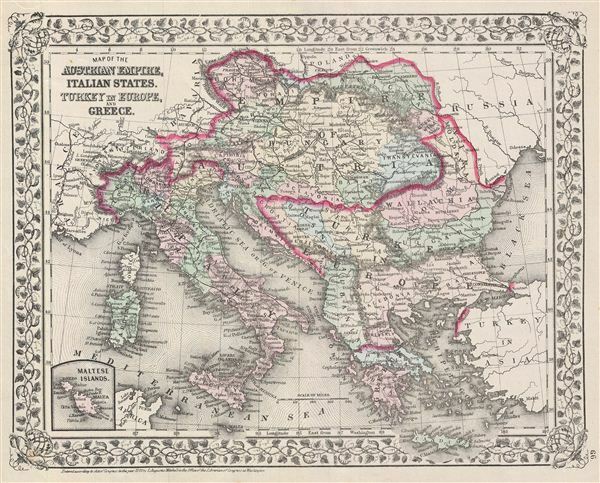 A beautiful example of the legendary American map publisher Samuel Augustus Mitchell Jr.'s 1872 map of the Austrian empire, Italy, Turkey in europe and Greece. Covers from Bohemia south as far as the Mediterranean Sea. An inset in the lower left quadrant features the Maltese Islands. The Austrian empire, founded in 1804 by the last Holy Roman emperor, Francis II, lasted only till 1866. It was transformed into the Austro-Hungarian empire after Austria was defeated in the Austro-Prussian War of 1866. Meanwhile Greece and the Balkans were witnessing the waning years of Ottoman hegemony in the region, with the Greek Independence movement liberating Peloponnese in 1821. The Ionian Republic, under the protection of Great Britain, was also free of Ottoman control. The other Grecian and Balkan states, including Serbia, Croatia, Moldavia, Wallachia, Albania, and Macedonia, remained at least nominally under Ottoman control until 1878.